Now that you are ready to start your pet on the BARF Diet®, you will need to determine how much to feed you pet as well as whether to adopt the fast or slow switch method. Just review the tips below and your pet’s transition to raw will be a breeze! 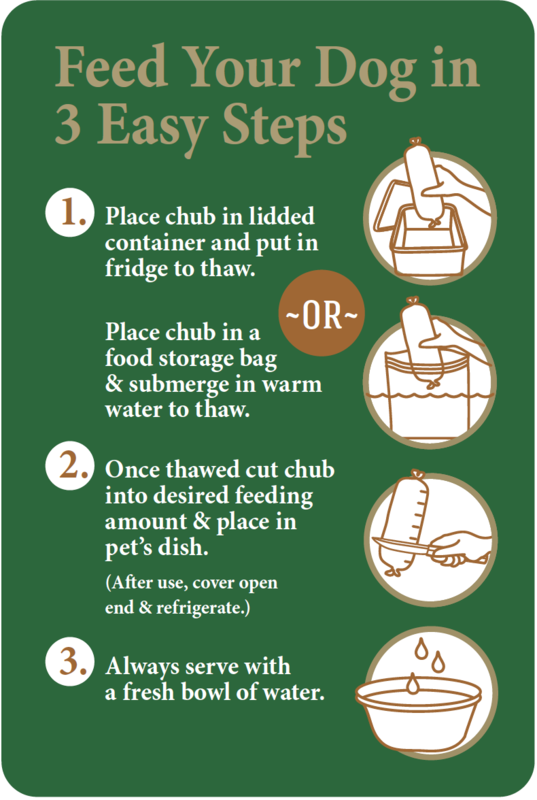 Use this feeding chart to help you determine how to feed your pet the healthiest, most nutritious pet food on the planet. Congratulations! You’ve just discovered the best way to improve the health and well being of your pet. It’s important to follow the guidelines below to ensure a successful conversion to our raw diet. We advocate a 6-day feeding schedule with the 7th day being a day of fasting. This gives your pet’s body a day to properly detoxify and eliminate the possible buildup of waste material. For most dogs, the fast switch method is best – it’s fast, easy and perfect for puppies and healthy, active dogs. If your dog is older, has a sensitive stomach or has a pre-existing health condition, then the slow switch method is best for you. Rapid Switch (Recommended Method): If your pet has a strong immune system and is generally quite healthy, an immediate conversion can be done. Fast your pet on the first day to allow the body to cleanse itself of toxins and to make your pet eager for their next days meal. Be aware that the normal detoxification process may cause temporary symptoms of vomiting or diarrhea. * This may also be the result of eating too fast, gulping, or possible temperature variations. *There is no need to be alarmed if these symptoms occur initially as your pet’s digestive system gets used to the change. 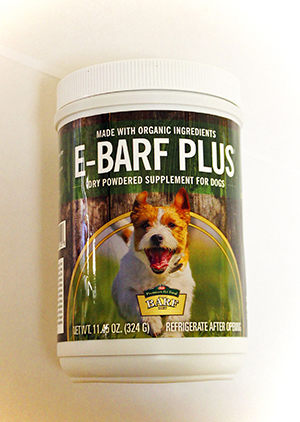 We recommend the same supplemental treatment of the E-BARF® Plus and salmon oil as we do for the slow conversion because it is always best to strengthen the immune system to maximize the digestion process. Slow Switch: This method is strongly recommended for pets with compromised immune systems or sensitivity to dramatic changes in diets. The raw meat diet should be introduced slowly to prevent major detoxification symptoms. Day 1: Fast your pet. Allow the body to cleanse itself of toxins and get your pet eager for raw. Day 2: Start out with 10% being the raw diet and 90% of their old diet. Because the digestion time is different for processed diets and raw meat diets we suggest that you separate the feedings and feed the old diet in the morning and the raw food at night. Day 3-10: Increase the raw diet each day by 10% and decrease the old diet by 10% for the next 9 days. 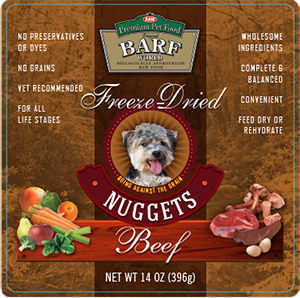 Scoop desired portion of nuggets based on your pet's weight and activity level. Feed frozen or thawed. Wash hands with soap after handling raw meat. To thaw, place in a container with a lid and defrost in the refrigerator. 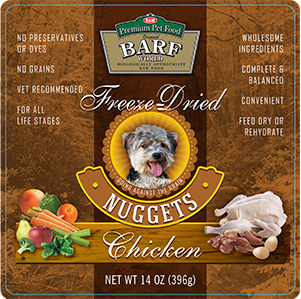 Do not re-freeze the BARF® once they have been thawed. Food will spoil if left unrefrigerated for an extended period of time. Excess food should be refrigerated for the next feeding or discarded. Want to give your dog an added boost? 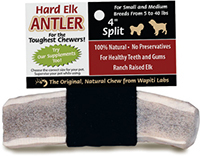 Here are two products that we recommend for first time BARFers® to get a head start on seeing some amazing changes in your pet. 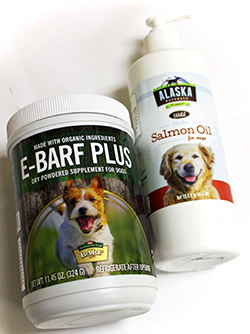 These two supplements are recommended to be used during the first 90 days of switching to BARF® and are also good for long-term use in pets with pre-existing health issues or for preventative maintenance. 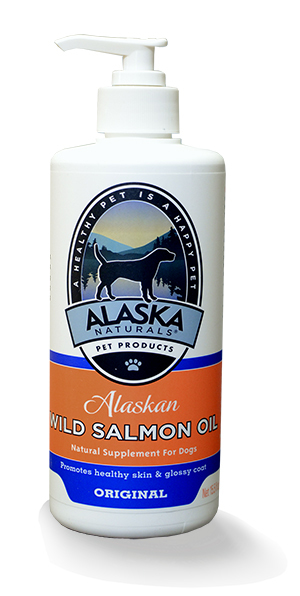 This bundle features two of our best-selling pet supplements: E-BARF® Plus enzyme and probiotic powder and Wild Alaska Salmon omega oil - guaranteed to help minimize any digestive upset and boost your pet’s immune system. Many dogs that have been on dry and canned food diets become used to the artificial flavors and fat sprays in commercial pet foods. Etta Says! 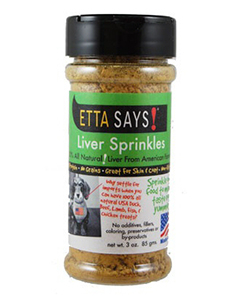 Liver Sprinkles protein powder is your special weapon to overcome finicky taste buds. More and more consumers are requesting information on calories in the diet because they are concerned about the proper feeding amounts for their breed. The feeding guidelines that we display on all our BARF World® Diet packages are strictly a guide or a rule of thumb. There are many variables that need to be considered in order to know what is a proper amount to feed. And most importantly the source of the calories. (Calories from sugar and starch are more fattening than from fat or protein). Processing plays a big role: overheated ingredients, despite identical caloric calculation, or even a cooked/extruded food is different in metabolizable calories than the same identical ingredients if not cooked, microwaved or heated. Label claims of caloric content are so useless as to be more harmful than good. The most important thing to remember in the proper feeding of a diet is the trained eye of the keeper!!!! Feed the animal the amount that allows your dog to have the body condition you want. Dog with no activity- The amount that maintains ideal weight may not be enough to keep the dog feeling full, so begging may ensue. Displace this behavior with chew toys, walks, and other activity. You can also consider feeding the daily ration in more frequent meals (reduces begging). Dog with average activity- feed per the feeding guide, adjusted to the amount that maintains ideal weight. Dog with high activity- Give the dog as much as the dog will eat without gaining weight. Stool volume will go up. Lactation- Free choice- keep in mind that in as early as 3 weeks the puppies may be consuming some of mom’s food. Puppy Large and Small- (Keep in mind that often a pet owner does not know how big a dog will be. Obviously, someone who bought a purebred knows the adult size, but they are a minority. Knowing the mother’s size is not a proper indicator either). Puppies should be fed frequent small meals. There is far more danger from overfeeding than under feeding. If bone and stature appear to be increasing properly, a leaner body condition is much preferred to a butterball physique. Dogs are growing for 18 months, with small breeds reaching adult metabolism a little sooner. 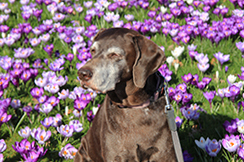 BOTTOM LINE RECOMMENDATION – The best source of accurate information is the trained eye of the pet owner! Switching your dog to a raw meat diet? Try to heat the diet slightly to change the temperature and then each day back it down to feeding it raw. Add a little warm water to the mix and make a slurry out of the diet. Sprinkle a little powdered garlic on the diet. They love garlic. Try different varieties of protein choices to find one they like. Don’t let them win you over. Be persistent and keep trying to get them to convert. Their health is at stake – don’t quit trying to convert them to the new diet. 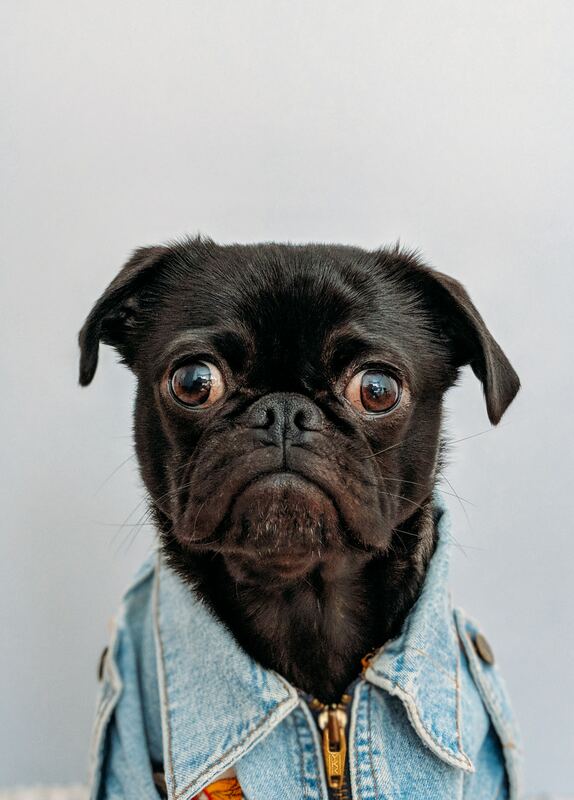 Most dogs will have no problems doing a fast conversion (a slow conversion is always suggested when the immune system has been compromised from antibiotics, steroids or vaccinations).